Tennessee has 15 USHCN stations ranging from Clarksville to Waynesboro. 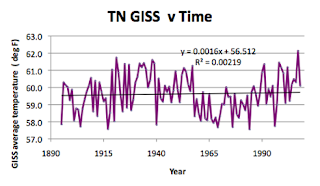 It also has three GISS stations on the list; Chattanooga, Knoxville and Nashville. The first thing, as always, is to download the temperature data. 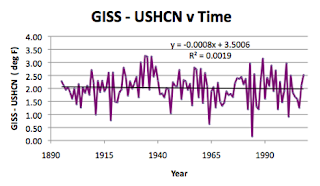 This week there are no surprises, although even the GISS averages show that there has not been much change in the temperature of the state over the past century or so. An average increase in temperature of 0.16 deg F per century is hard to get excited over. 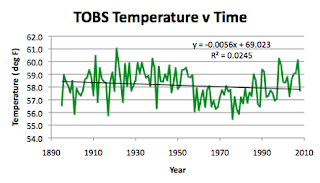 (And note that the temperature was more consistently higher in the 20’s and 30’s an embarrassment that starting new series post 1948 will manage to conceal from the typical audience). 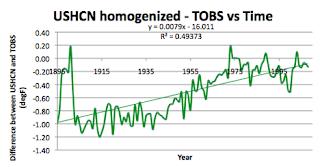 The difference between the GISS average and the USHCN homogenized average is also fairly consistent at 2 deg F.
Looking at the TOBS raw data for the temperature average, this shows that, prior to homogenization, the temperature of the state has actually declined over the past century (by about half a degree), interesting! Tennessee is 440 miles long, and 120 miles wide. 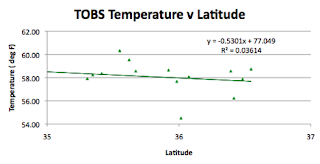 The geography of the state is that it lies roughly between 81.6 deg W and 90.5 deg W, and between 35 deg N, and 36.68 deg N. The center of the state lies at Latitude 35.79 deg N. The average USHCN station latitude is 35.8 deg, while for the GISS stations it is at 35.71 deg. 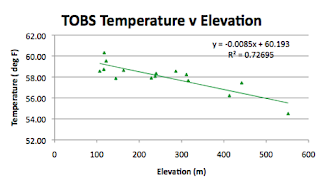 The mean elevation of the state is 274 m (from 54 m to 2,024 m). The USHCN average is 253 m, and that of the GISS stations 231 m. (Peeking ahead the correlation with elevation gives a temperature rise of 0.85 deg F per 100 m, so that 20 m intervals should change temps by 0.17 deg F). 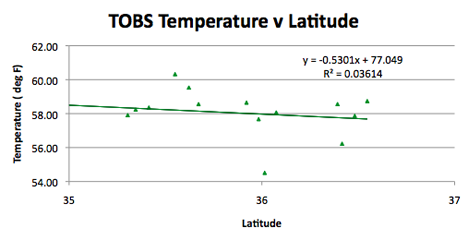 There is not a particularly good correlation with latitude for this state, the low temperature at Crossville (the point just above 54 deg) is not immediately explicable. I no longer think Longitude is important, and given that land gets lower as one moves West, this explains the correlation that appears to exist for Tennessee. Since the trend changes when the elevation increases, moving further west in other states, I continue to think this unimportant. In contrast, the elevation correlation is important (see above). And when one looks, one sees that Crossville happens to be the highest station in the state, thus explaining the low temperature reading. 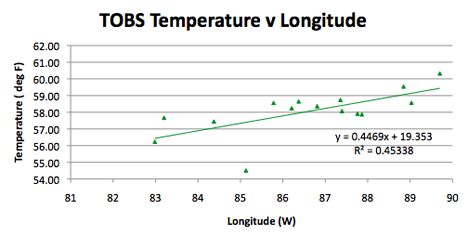 Again Crossville has the lowest temperature, though because of the shorter period, the value is higher in this case.